Take-off after work, drive half-way from Denver to Park City where I was staying. Half-way point: Meeker, Co. The drive was noteworthy, with temperature ranging from 95F in Denver to 55F just on the other side of the Continental Divide with a crazy downpour that made driving downhill from Eisenhower Tunnel more like sledding. Aquaplaning is the word. Crazy. The Colorado River in Glenwood Canyon looked still impressive but man it is low. A lot of water is being missed downstream. Driving from Rifle to Meeker made me feel like a lonesome cowboy. No traffic, the road to myself, impressive landscape. Oh, and some really bad Mexican food in Meeker. Bland would have been very tasty. Highway 64 to 40, following the White River downstream. Surprised I am allowed to do 65mph on that type of road but hey... this way I will get there quicker. Dinosaurs! Yes, dinosaur status everywhere in the city of Dinosaur. Even at the intersection with 40 and the school playground. Guess the big attraction around is... Dinosaur National Monument. Cool landscape. Still feeling like a cowboy, maybe even more so than the day before. Now I am in Utah and feel like I am almost there. Well, just a few more hours. Passing some interesting water, including Strawberry Reservoir. Man, that looks fishy. One more hill and Heber Valley is in reach. The Provo flows through Heber... I think I will fish the Middle Provo before calling it a day. When I got to the Bunny Ranch, there were a few cars and a couple guys calling it a day saying the fishing is tough, one a fish or two to hand. One was complaining about the flows and saying he's heading up to the Weber. The other was actually handing me some flies that should work. Beaded San Juan Worms... I am polite and say thank you and put them in a box with "retired" flies. I gear up and head to the river and hes, it's flowing high. But hey, I fished it before with my 9ft 5wt before and the flows were even higher back then and did ok. Well, half an hour into it I had already 5 brown trout. Dinks, around 5" to 7", but all caught on a sakasa kebari. 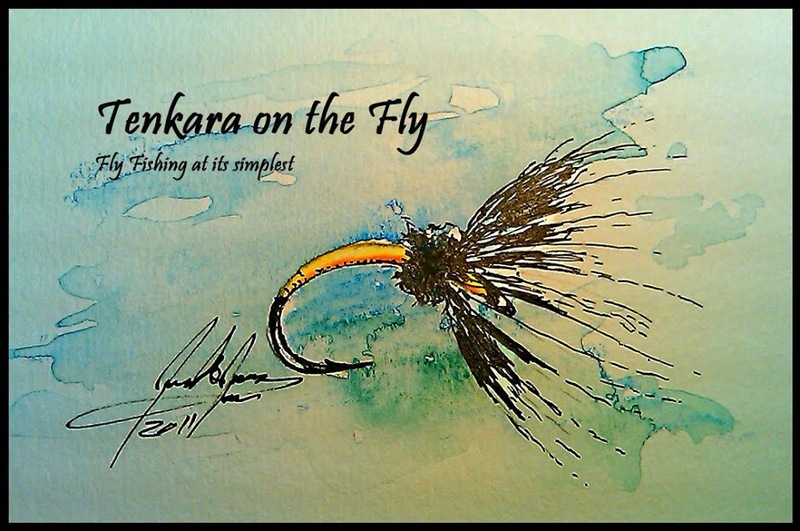 Knowing how to and where to fish high water is key, focus on the edge and slower water. Best trout was around 13" to 14", a bit longer than the handle on my Ito. 18 fish to hand when I was wrapping up around 4.30pm. I forgot how windy it gets on that river in the afternoons. Packing up and driving the remaining few miles to Park City and chill. Middle Provo River around the "Bunny Farm"
I met up in the morning with BC in Provo and headed to some "undisclosed" creeks, a request of BC that I honor. The first two creeks yielded only one fish since they were running pretty "off-color". Then we headed a bit south and hit a tenkara perfect little creek with very willing rainbow trout. 'Nough said. Day 4 - Friday July 27th - Fishing with Anthony Naples of Casting Around and hiss friend Jeff, Paul Gibson of Tenkara-Fishing.com and Chris Stewart, the TenkaraBum. Friday started out early and with an interesting drive from Park City to Spruce Campground in the Big Cottonwood Canyon over the mountain instead around it (via SLC). This road, which I knew was unpaved, turned out to be probably the worst road I personally drove a vehicle (there was one road that was even worse in New Zealand but I was a passenger only). Anyway, the highlight of this short drive that I spotted a mother moose next to the road and a calf right on the road. I never came so close to a moose before. Pretty cool. Anyway, at the campground we all met and decided to head over to the Little Cottonwood which was the bigger and supposedly easier water to fish. It turned out this was true, the water was rushing, gin clear and strewn with nice big boulders. Fishing was a bit challenging; I started out fishing downstream but I didn't start catching fish until I decided to fish upstream (gin clear water, remember?). I quickly got 2 brookies and a rainbow out of the same pocket water and was able to pick a fish here and here going forward. Fishing wasn't fast but very satisfactory. When we were sort of done and ready for a break, Chris and I were a bit in a pickle, we couldn't really move back or forward and the only way out was through some very thick brush (turned out that there was also some poison ivy...) and it took us a while and some sweat and strong words to get back to the trail. Anthony met us on the trail, he was smart enough to get off the river sooner that we did. The three of us hiked back to the cars on that trail which was closely guarded by a rattle snake that gave us a nice friendly rattle while we made our way past it (Anthony had the pleasure the walk by it for a third time and point it out to us ahead of time so that we were prepared). Back at the cars, Paul shared a funny story about cops, a sword yielding wanna be samurai and some Japanese tenkara anglers further upstream... some teasing was in order later that evening! Since Jeff, Anthony's friend had a little accident and got his leg pretty bruised, he and Anthony decided to call it a day. Chris, Paul and I jumped in our cars and headed back to the Big Cottonwood and give it a try. The water was definitively smaller and brushier. Again, it took me a bit to adapt but soon I got into some smaller brown trout with a nice one to close out this day's fishing. Big Cottonwood - looks nice, doesn't it? Friday evening I headed back to SLC for a small get-together with Daniel Galhardo of Tenkara USA, the TenkaraGuides, the Japanese guests and a few new friends for drinks and dinner. Part 2 - The Summit will follow later this week, I am heading to NYC for business.